On January 21, 2016 I attended a workshop on Basic Leather craft from Soulflower. I’d heard of them through a Facebook group about (what else) Traveler’s Notebooks. They were recommended by one of the members, accompanied by a proud picture of one of her creations. I’d been slobbering for just such a workshop and instantly messaged her to get the details (Thanks, Jacqueline!). I forgot to take pictures because I was so excited furing the workshop; many of these photos were taken by Pat, our facilitator. They do jewelry design primarily; leather was a secondary add-on. Workspace at Soulflower in Quezon City, Teacher’s Village. The workshop, held in their small workspace near the famous Maginhawa food street, included lunch at Rustic Mornings and a short tour of Marikina’s leather-goods stores for P4,000 ( at the time). 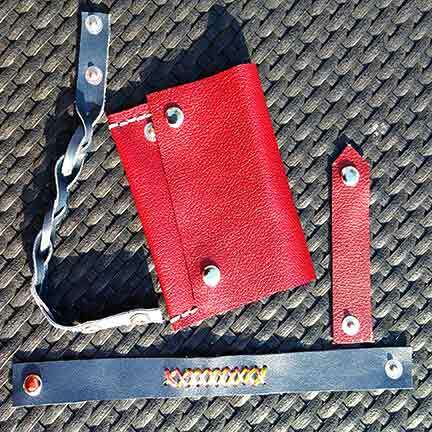 It’s a good deal, because they provide the basic materials (scrap leather, buttons, fasteners, pounding board, some thread, rulers, mallet, etc.) and insider tips on how to get what you want out of the old-style Marikina shops.During my workshop we had an even better deal because there was only one other woman attending (hi, Elora! ), and we got to hog our facilitator Pat! So: sulit na sulit! The first three hours is spent learning how to make leather cuffs, cord holders, and a small purse. You learn how to fasten buttons, how to stitch leather by hand, how to cut leather, and how to measure it. It’s not difficult, and Pat, our facilitator, as very generous with the questions. Pat had invited us to bring any patterns or examples of leather items that we wanted to make. Of course I showed her a TN, and she gave some tips on what skills to develop for making them. Sorry Pat, my cuts and stitching are still crooked- it’s not your fault! Materials for the leather workshop. Afterwards it’s on to lunch. Rustic Mornings is an excellent restaurant and something of an area legend and yes, you get to order what you want ( it’s not a boxed/fixed meal or anything like in other workshops). The restaurant is a short drive away from two of the shops we visited, Nation (for leather and tools), Trans Asia Shoe and Upholstery Supply, Nation Leather Supply ( both owned by the same family), and Otto shoes, which has a large store for leather hides behind the shoes- who knew!?! Of course you could always visit these stores yourself without taking the tour. That’s exactly what I did when I’d first heard about them in February. If you do that, though, you won’t get Pat’s thorough advice on the items you’ll need to get, or her “suki” relationship with the proprietors. Let’s just say that the customer service in those shops is….old fashioned, too: Courteous and well-informed, but they expect the same from you—or else. They mostly serve shoemakers and leather crafters who already know what they need, fast. Good luck on getting guidance if you’re a total newbie stuck on decisions! Choosing leather hides at Otto. Photo by Pat. We weren’t able to purchase leather at Nation at that time because they were very busy and we were running out of time, so we headed over to Otto Shoes. Apparently you have to buy leather by the whole hide- either that, or scraps by the kilo. Rolled and ready to go! Photo by Pat. If you’re making small items such as pouches or purses, the kilo scraps will suffice. For larger items like notebooks and bags, expect to spend P1500 or more for a decent hide. I bought a couple- one large supple rich brown hide that I intend to turn into TN’s, and one patent purple hide for book covers. I also bought lots of materials- probably more than I need. Oh well, it helps to be prepared, right? By the way, when buying tools, don’t expect them to have have that shiny industrialized look of materials you’d find in department stores. They look a little, uh, aged. The variety/ amount are far from exhaustive. You should still be able to find the basic stuff though. For the rest, I guess there’s Amazon? One more tip: You can go on the Marikina tour with Pat for P350 if you skip the workshop and bring your own transport (and, sadly, no lunch at Rustic Mornings), but for repeat customers this is a great opportunity to restock on tools, get new ones, and still pester Pat for advice! We finished at about 5 am back at the studio after braving the traffic in Katipunan. I enjoyed the workshop so much that I contacted Soulflower again to set up a workshop specifically for TN’s. There are some complex designs in my head that I can’t wait to get on the table. If that goes through, I’ll let you know how it goes!